There are three ways to say goodbye to your Android tablet; only one of them involves renting a steamroller. The other two methods are documented below. Locking the tablet is cinchy: Simply press the Power/Lock button. The display goes dark; your tablet is locked. Your Android tablet still works while locked; it receives e-mail and can play music, but it’s not using as much power as it would with the display on. The tablet will probably spend most of its time locked. Locking the tablet isn’t the same as turning off the tablet. It’s more like a computer’s sleep mode. Indeed, a locked tablet is often described as a sleeping or snoozing tablet. Any timers or alarms you set still activate when your tablet is locked. To unlock your tablet, press and release the Power/Lock button. You can manually lock your tablet at any time by pressing the Power/Lock button. That’s probably why it’s called the Power/Lock button. When you don’t manually lock the tablet, it automatically locks after a given period of inactivity. Touch the Home icon to return to the Home screen. The lock timer begins after a period of inactivity. Specifically, when you don’t touch the screen, the timer starts ticking. About 5 seconds before the timeout, the touchscreen dims. Then it turns off and your tablet locks. If you touch the screen before then, the timer is reset. Press and hold the Power/Lock button. You’ll see the Device Options menu. If you chicken out and don’t want to turn off your tablet, touch the Back icon. Touch the Power Off item. The Android tablet turns itself off. The tablet doesn’t run when it’s off, so it won’t remind you of appointments and won’t collect e-mail, nor will you hear any alarms you’ve set. The tablet won’t be angry with you for turning it off, though you may sense some resentment when you turn it on again. The Restart option may not be available on all Android tablets. 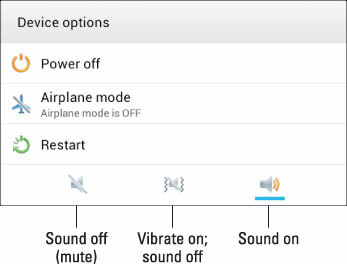 Some tablets may have a Silent Mode option instead of the sound icons. The Device Options menu is titled Tablet Options on some Android tablets. Other tablets may not title the menu at all. Ensure that your tablet is kept in a safe place while it’s turned off.